Supported Codes function. Only some KWP2000/CAN/UDS control modules support this function and there is no way to tell which have this capability without trying the function. 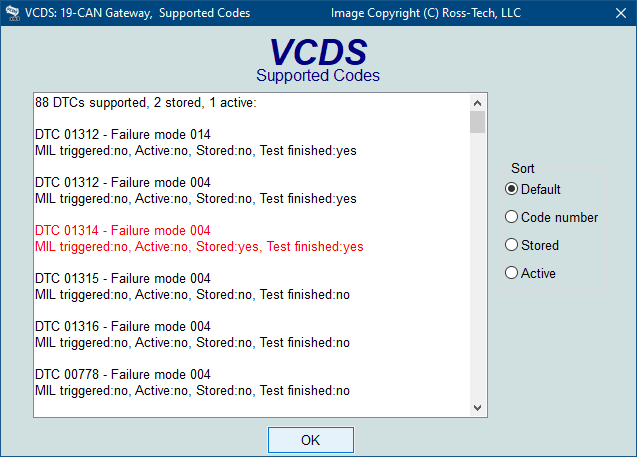 VCDS can show all DTC and Failure Mode combinations that a control module is capable of detecting, including the current status of each. You can sort the results by selecting the radio buttons on the right side of the screen. Use [OK] to return to the Controller Info / Select Function screen. Note: On the Open Controller screen, the Supported Codes button will appear in place of the Single Reading function in modules that support it, since the two functions are mutually exclusive. Unless otherwise noted, all content on this site is Copyright (c) 2000-2017 by Ross-Tech LLC. All rights reserved. "VCDS", "VCDS-Mobile" and "HEX-NET" are Registered Trademarks of Ross-Tech, LLC.